The Graduate Record Exam (GRE) is an exam taken by college graduates who are applying to graduate school. Whether you're studying the arts, business, the sciences, and humanities, or another discipline, your school may require scores from this challenging exam as part of the admissions process. A high GRE score is critical to set yourself on your way to gaining admission to the school of your choice. The GRE General Test is composed of three sections: verbal reasoning, Quantitative reasoning, and analytic writing. The four books listed below offer instructions on how to complete each section of the test, strategies for being successful before and during the test, and practice questions to get you ready for test day. While there are a lot of study guides out there, these four are the top in the industry and earned the reputation they deserve by providing high-quality material that prepares students for this important exam. With one of these books and some hard work and dedication, you can be on your way to earning a high score on the GRE and entrance into your graduate school of choice. Educational Testing Services (ETS), the maker of the GRE, offers the only official guide to the test. Known as the authoritative guide to the GRE for a good reason, because it's made by the same company who creates the test, it is one of the most recommended test-taking guides. This guide has a good reputation because they can prepare you for exactly what you should expect on the test. This guide comes with four complete real test (simulated, computer-delivered POWERPREP� practice tests). It has hundreds of authentic test questions, detailed descriptions of the Verbal Reasoning and Quantitative Reasoning. Content areas include tips for answering each type of question and an overview of the two types of Analytic Writing Tasks you will encounter on the test including scored sample responses with actual raters' comments. Manhattan Prep, a leader in test-taking readiness, offers a broad range of products to help you prepare for the exam. This book has over 1000 pages. It has more than 2000 questions (book and online). There are 1400+ words (for GRE Vocabulary). Highly recommended. It will cost your around $20 from Amazon. It has several detailed chapters for quantitative topics like algebra, coordinate geometry, probability etc. GRE Vocabulary flashcards, and more. There are over 300 pages and first edition was launched in June 2018. It has 3 Full-Length Practice tests(one of them is online). 14 Days Online Comprehensive Prep Included with Book. There is a video explanation for online questions. In addition, book offer over 500+ practice questions for the Verbal Reasoning & Quantitative section of the exam. Barron is a name that is well-known in the testing industry, and their GRE preparation book stands up to the name. 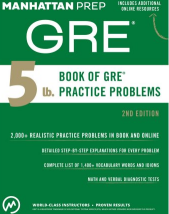 This 624-page book comes with one diagnostic test and two full-length models of the actual test structure reflected in the GRE. Additionally, not only are all answers provided for the sample tests, but Barron provides explanations for the answers as well to help you fully prepare for what you will encounter on the GRE. With the purchase of this book, you can access to Barron's online GRE Course and iPad app for essay preparation. This comprehensive new package includes strategies, test-taking instructions, and practice questions to help you tackle this challenging exam. This book also includes a digital iPad download and DVD and online access to 22,00+ questions. It offers 6 online Practice Tests. You also get free DVD and mobile application to study. This book is stocked with a wealth of test-taking strategies to ensure you are successful. Kaplan also provides academic support from faculty on their Facebook page and a guarantee that if you use their resources and strategies, you will score higher on the GRE General Test or receive a full refund.